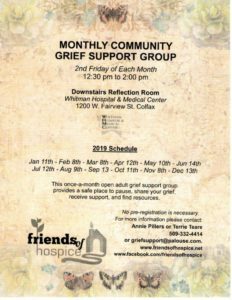 This Drop-In Grief Support group is open to all adults on a monthly basis. Gather with others in a safe, confidential space to explore the grief journey. No pre-registration is required. Held the second Friday of each month at Whitman Hospital & Medical Center, downstairs Reflection Room, at 1200 W. Fairview Street in Colfax. This Drop-In Grief Support group is open to all adults on a monthly basis. Gather with others in a safe, confidential space to explore the grief journey. No pre-registration is required. 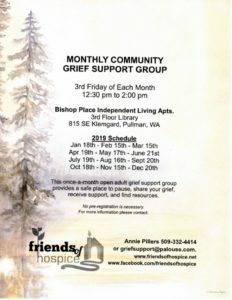 Held the third Friday of each month at Bishop Place Independent Living, 3rd Floor Library, 815 SE Klemgard Street, Pullman, WA. 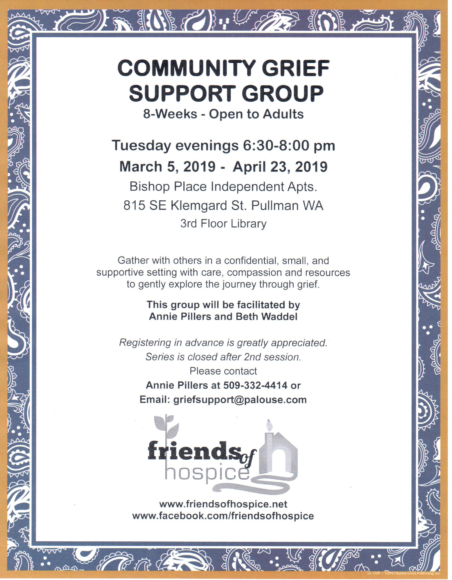 This 8-week grief support group is open to adults Tuesday Evenings 6:30 – 8:30 pm March 5, 2019 – April 23, 2019. Registering in advance is greatly appreciated. Series is closed to new registrations after 2nd session. Gather with others in a confidential, small, and supportive setting with care, compassion and resources to gently explore the journey through grief. Held at Bishop Place Independent Apts. 815 SE Klemgard St. Pullman, WA in the 3rd floor library. 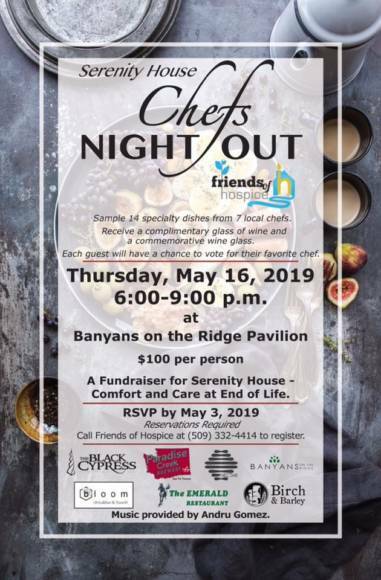 Join Friends of Hospice at Banyan’s on the Ridge on May 16th from 6-9 PM for a fun night benefiting Serenity House:Comfort and Care at End-of-Life. Guests will get to sample 14 specialty dishes from 7 local chefs and vote for your favorite chef. Each guest will receive a complimentary glass of wine and a commemorative wine glass.